Sunflowers not only pivot to face the sun as it moves across the sky during the day, but they also rotate 180 degrees during the night to greet the morning sun. UC Davis and UC Berkeley researchers have now discovered how they do it: They’ve linked their internal clock genes to stem growth, so that the eastern side of the stem elongates more than the western side during the day, turning the stem and flower westward to track the transiting sun. At night, the western side grows faster, turning the flower head back east in time to capture the rays of the rising sun. What’s more, once the plant has grown to maturity, the clock genes turn off this differential growth, leaving the flower facing east to gather the heat of the morning sun and provide a warm platform for pollinating bees. In the study, published Aug. 4 in the journal Science, “we show that these roles impact how much the plants grow and how well they attract pollinators, thus demonstrating that this regulation of light-responsive growth by the clock is likely an (evolutionary) adaptation,” said co-author Benjamin Blackman, an assistant professor of plant and microbial biology at UC Berkeley. “It’s the first example of a plant’s clock modulating growth in a natural environment, and having real repercussions for the plant,” added Stacey Harmer, a professor of plant biology at UC Davis and the paper’s senior author. Just as animals have internal circadian clocks to regulate cycles of sleep, temperature and hormones, plants too have an internal clock to regulate the 24-hour cycle of plant hormones, Blackman said. Harmer’s lab had previously discovered links between “clock” genes and the plant hormone auxin, which regulates growth. Working with Blackman at the University of Virginia and, starting this year, at UC Berkeley, UC Davis postdoctoral fellow Hagop Atamian staked plants so that they couldn’t move or turned potted plants daily so that they were facing the wrong way. They found that they could disrupt the ability to track the sun, and documented that plants that follow the sun get a growth boost: Sunflowers staked so they can’t move have less biomass and leaf area than those that do, they found. Blackman noted that many plants orient their leaves toward the sun and turn back at night, but few act like the sunflower to turn the entire stem. 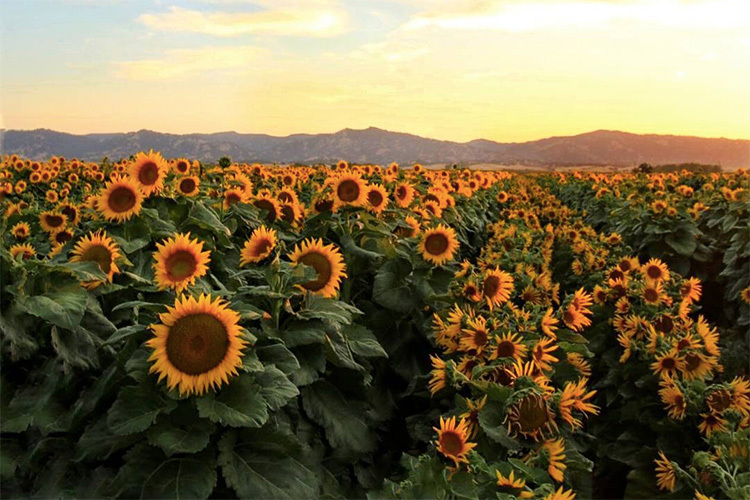 This behavior of sunflowers was described by scientists as far back as 1898, but no one had previously thought to associate it with circadian rhythms. “Before our experiments, few studies – the latest more than 50 years ago – had assessed how sunflowers returned at night, and they had suggested some internal ‘habit’ was involved but did not directly implicate the clock,” he said. The team identified a number of genes that were expressed at higher levels on the sunward side of the plant during the day, or on the other side at night. Apparently, there are two growth mechanisms at work in the sunflower stem. The first sets a basic rate of growth for the plant, based on available light. The second, controlled by the circadian clock and influenced by the direction of light, causes the stem to grow more on one side than another, and therefore sway east to west during the day. They also investigated why mature sunflowers always face east, and found that east-facing sunflowers heated up more quickly in the morning – and also attracted five times as many pollinating insects. Again, the circadian clock helps lead to the eastward orientation of sunflower heads when they stop tracking as they bloom, Blackman said. Additional co-authors on the paper are Nicky Creux at UC Davis and Evan Brown and Austin Garner at the University of Virginia. The research was funded by the National Science Foundation’s Plant Genome Research Program. Do volcanoes or an asteroid deserve blame for dinosaur extinction?